This entry was posted in Home Improvement, Notes from a quilter, Organization, Tidying and tagged de-clutter, tidy, tidying by Becky Goldsmith. Bookmark the permalink. I totally agree. It’s just an overwhelming task – especially in the sewing room! If you do it a little at a time, it’s possible to deal with a sewing room. I’ve done it before and I’m sure I’ll have to do it again :-). I’m wondering if this has to do with getting older. For the last several years I have been wanting less and less. We downsized and moved several years ago so there was a big clean-out there and I haven’t replaced very much. Don’t miss any of it. And now my criteria for buying almost anything is: do I need this? Fabric excepted of course…….. Yes, I do think age has something to do with it. But it could also be the embracing of midcentury modern design. That look is not particularly cluttered. One thing I learned is to place towels folded edge showing. This allows removal of a towel, even in the middle of the stack, without disrupting the others. It has helped me many times to prevent every towel from tumbling out of the shelf. i really enjoyed this post and needed it. After moving from over 1900 sq ft, to 500 sq ft, with very little storage, it is easy to be cluttered. Especially as I love to sew/quilt/knit/crochet/embroider and must do it in the living room. 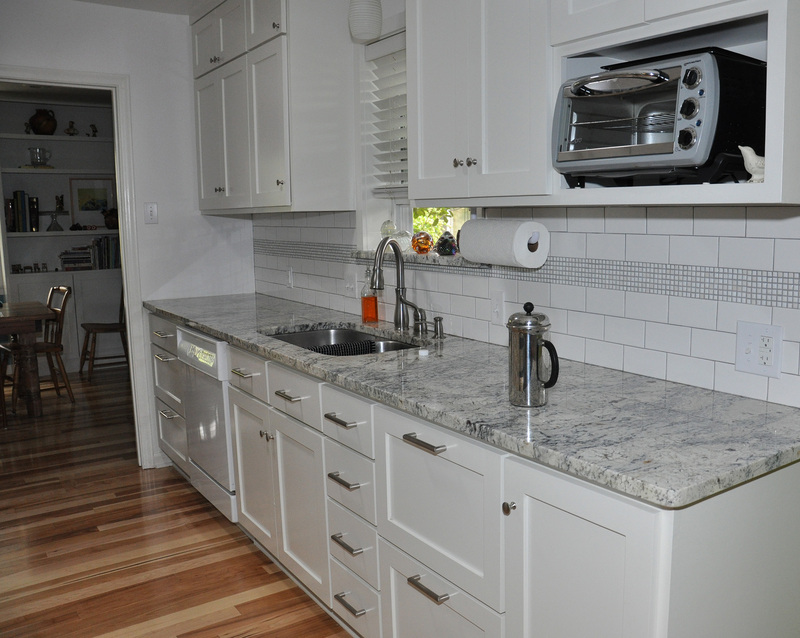 I love the look of your kitchen. You have inspired me. 500 sq ft… that sounds both wonderful and frightening. I have 1725… I know I could live without some of it, even though we do use all of our spaces, just not all the time every day. I hope you live in a climate where you can utilize a lovely patio. It must be something in the air because I was struck by the same yen to declutter for the past couple of months. Mine is going slower, but everyday something goes out in the trash, into a bag for Salvation Army or something gets better able to be found. Thanks for the article. I’m going to look for the book. 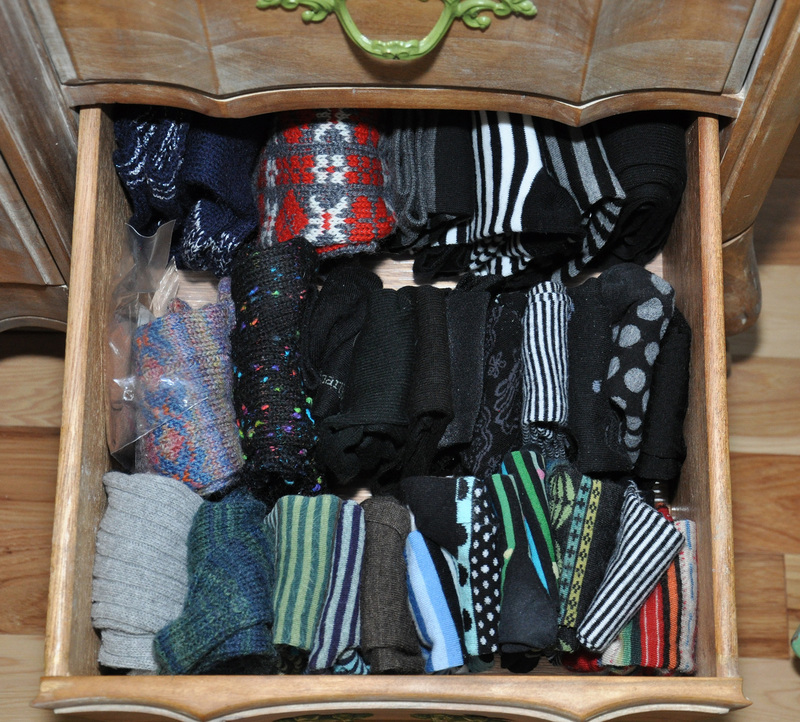 I tackled my sock drawers (yes plural…one for white athletic socks for sneaker wearing, one for colors) a few months ago. What does a Florida girl who lives in flip flops and only owns 3 pairs of closed toed shoes need with OVER 100 pairs of socks? I dont know either. I got rid of more than half….it felt so good. I dont fold or roll them. I stick one sock inside of its mate and then line them up….so you always grab a pair. I need to get a handle on other clutter, but it is so overwhelming! I suspect I will still be folding for a few weeks to come. But that’s OK… I’m sort of enjoying it. We also went to an open house which had been professionally decorated. The only clutter was the accessories. The feeling that came to me was that it was relaxing as there was not stuff laying around which would require someone to do something with (work). Sometimes less is more. If you read the book, you would know that aside from using the KonMari folding method, you should store your clothes vertically, and not horizontally. You are putting more weight on the clothes on the bottom, which causes wrinkles, and the clothes do not last as long. Good to know. I really do need to read the book. Later. Probably :-).